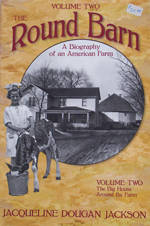 The Beloit Historical Society offers a selection of books to purchase. Below are the current selection of books for sale. Counts are as of July 23, 2018. Below you can find a complete list of available yearbooks and their quantities we currently have. 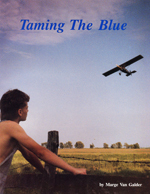 Contact us today if you'd like to order a yearbook from Beloit High School's past! Beloit Catholic High School Yearbook. 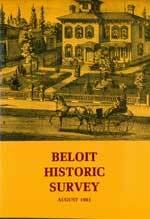 Below you can find a complete list of available city directories from Beloit's past. 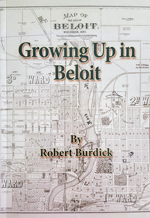 Robert Burdick's Growing Up in Beloit, serves as both an homage to coming of age in a gentler era, and as a poignant love letter to his beloved Midwestern hometown. In a lively narrative, Burdick brings to life the universal exuberance and industry of youth, from comic adventures, pranks, and pratfalls, to the more serious business of navigating academics at school and experiencing hard work at a vareity of jobs. 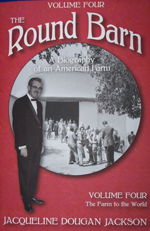 His vivid descriptions of daily life in Beloit, Wisconsin in the 1940s and 1950s will appeal to locals interested in community history...and to anyone yearning to slip back in time for an amiable visit with a likeable young man. 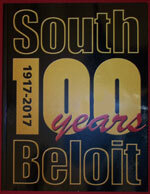 Celebrating 100 years of South Beloit history, this volume written by John Patrick and Diana Lukich, details the early (native american) inhabitants and settlers, notable figures, historic buildings, organizations and events. Present day organizations, churches, and businesses are also described. 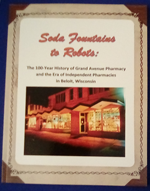 128 pages; b&w and color photos; published by the South Beloit Historical Society. Even your digitized information sometimes requires a paper back up. With this permanent reminder calendar from BHS (the "Centennial Chronical of Remembrances" - 1910- 2010 - they didn't have spellcheck back then) you can keep track of all the important dates and take a stroll down memory lane at the same time. 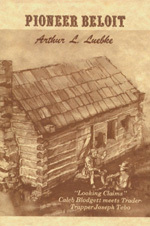 In Part I, the story of the Turtle Village during the last years of Indian occupancy and the Black Hawk War, the coming of the trader-trapper Joseph Tebo, and the determined efforts of Caleb Blodgett, Dr. Horace White, and a few score friends and neighbors to carve out a New England-type village at the confluence of Rock River and Turtle Creek during the first two years after their arrival. A painstaking reconstruction of life as it was actually lived at New Albany, later Beloit, almost on a day-to-day basis, gathered from pioneer documents, some newly discovered, others long-since forgotten. 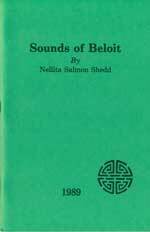 In Part II, the chronological story of a century-old dispute over who named Beloit, what year it was named, and how the name was actually arrived at. The author reviews a fascinating controversy extending over several generations that at times assumed the proportions of a scandal, involving the veracity of several distinguished first settlers. By carefully marshalling all the pertinent evidence available, the author frees the record as much as possible from obvious historical errors and needless confusion, before summing up the evidence dealing with the mystery of Beloit's naming. 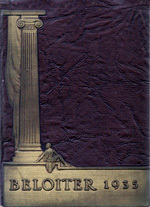 A collection of personal reminiscences by scores of contributors, "Sparks" is a unique document of Beloit history. Essays range from memories of local business and industry to recollections of family and childhood, and the volume is full of archival photographs. The editor Joseph Rhodes is past curator of the Beloit Historical Society, long-time educator and community leader. It has been 128 years since fire raged through several mercantile buildings on Turtle (now State) Street in the young and growing settlement of Beloit. Though there must have been earlier fires, the burning of E. D. Murray's store prompted the weekly Beloit Journal to comment on the "utter foolishness of the village to remain so long without necessary means of extinguishing fires and preventing their extension." 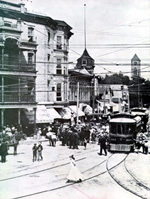 Whereupon, A. J. Battin, a former New York City fireman, organized a drive to raise money to buy the city its first "water witch" fire wagon and recruited a company of volunteers. 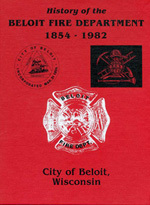 That was Beloit's first "fire department." Not until 30 years later did the city have a central water system. And not until 1887 was the first paid force of firefighters established. 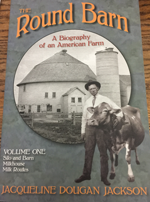 This book traces the history of Beloit's battle against fire. It is a story of the fire service from that beginning in 1854 to . . . [1982.] and it is a chronicle of the major fires dating back to the one that broke out the night of April 6, 1854, at the rear of E. D. Murray's store, supposedly the work of arsonists. The story of firefighters, the fire apparatus, the firehouses, and the fires in Beloit's history might never have been so completely and accurately recorded, had it not been for Herbert V. (Christy) Christiansen. He was Beloit's 10th fire chief [under a paid department] and he retired in 1979. Marge Van Galder was married to the late Russel E. Van Galder during his four and a half decades in aviation. She was his ticket seller in barnstorming days, later airport office manager and ground school instructor. From her unique perspective, she is able to relate the development of aviation from the 1930's through the 1960's. 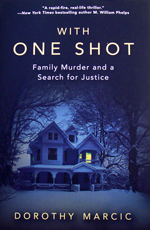 Her dynamic writing style makes this a most enjoyable and informative book. 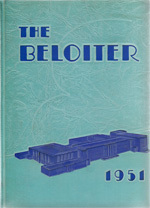 This collection of articles appeared over a three year period in the Shopping News, they bore the title Remembering...because they recall a city and events almost forgotten, they are reprinted here for family, friends, and fellow Beloiters. One hundred years can mean as many changes in a church community as it does in the community at large. Growth is detailed in a succession of priests, nuns, organizations, schools, and outreach programs. 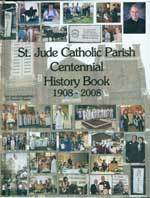 The history of St. Jude is a corollary history of Beloit itself. 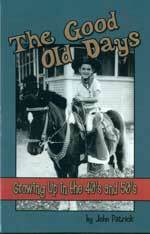 This book is a series of recollections from the youth of John Patrick, a Beloit native, focusing on the 40's and 50's. 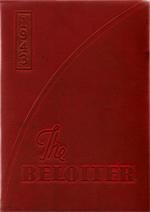 If you grew up in Beloit or around this era, it will bring back some of your good old memories. 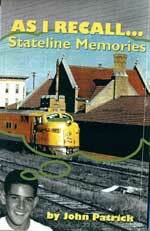 John Patrick is a lifelong resident of the Beloit stateline area, his books record his memories of people and places in the community in a light and entertaining manner. A 1980 intensive survey revealed that Beloit had a number of historic structures in three historic districts (and 26 properties outside those districts) that were selected for inclusion in the National Register of Historic Places. The Survey describes (some with photos) those structures and lists the 26 additional sites, describing the architectural styles in use. 24 p., b & w photos, center map. Windows to Our Past - $20.00 Only 1 remaining! Wisconsin Angel - $13.00 Only 1 remaining! Sinnissippi Reflections - $15.00 Only 3 remaining! Take an Idea and Make It Go - $20.00 Only 1 remaining! 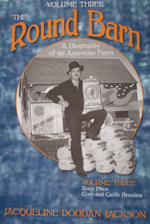 Native American History of Macktown and Stephen Mack's Pecatonic Settlement - $20.00 Only 1 remaining! DVD Hanchett-Bartlett Homestead: A Monument to Two Pioneer Families - $20.00 Only 1 remaining!